Compared to birds that have received more than 50 years of research by scientists studying the mechanisms of migration, bat migration has been treated like one of those unwanted chores, acknowledged but neglected. Knowledge on the different aspects of migration is essential for the conservation of migratory species and for migratory bats. These aspects of migration include timing of migrations, flight paths used and stopover points to name but a few. We are specifically interested in the migration and movement patterns of bats feeding exclusively on insects (also known as insectivorous bats). Large populations of insectivorous bats control crop-raiding insect populations, decreasing the need to use poisons and thus holding an economic value for us humans. These bats are also sensitive to environmental stressors, such as decreasing food resources, and are therefore good potential bioindicators. A bioindicator is an organism that helps scientists to assess the quality of an environment, especially relating to pollution. Many insectivorous bats make their homes in caves, where they rest (known as roosting), rear their babies and over-winter. Each of these activities require very specific temperatures, therefore bats are fussy when it comes to selecting a cave to call home. Caves are unique ecosystems that are sensitive to changes in the surrounding landscape, and destructive changes like deforestation can have major impacts on the internal climate of a cave. This in turn affects the resident bats. The Natal Long-fingered bat (scientific name Miniopterus natalensis) is an insectivorous, migratory bat species with a very high dependence on cave habitats. Little is known about their migratory habits and the caves that they use. 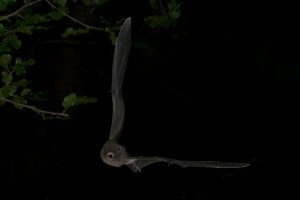 Historically, there have been few reviews dealing with the overall pattern of bat migration, all of which suggest that bat migration is a relatively rare occurrence. This alleged rarity may however be partly due to the lack of knowledge. Why has it been so difficult for scientists to study the migratory behaviour of animals like small insectivorous bats? 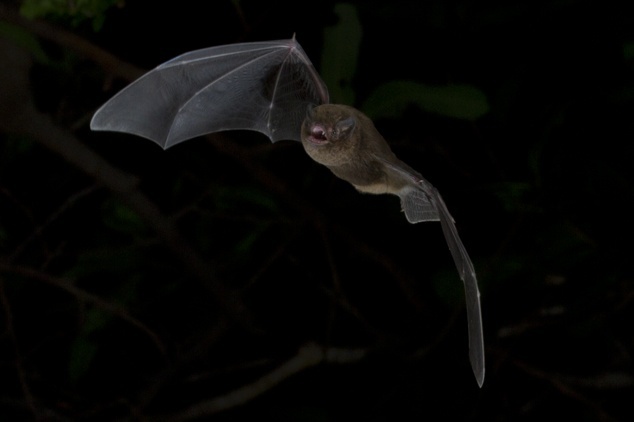 Scientists have called this dilemma the “small animal problem.” Due to the small size and light body weights of insectivorous bats, they cannot physically carry the satellite trackers necessary for long distance tracking. The American Society of Mammologists recommend that tracker size may not exceed 5% of the total body mass of an animal. As an example, it is like a human weighing 70 kilograms carrying around a backpack weighing 3.5 kilograms all day and all night, not taking it off once. The satellite transmitters needed to track bats over long distances weigh on average 9.5 grams and are therefore limited for use on animals weighing more than 190 grams. This tracker weight means that 60% of mammal species are excluded from traditional tracking studies. Furthermore, some of these trackers require solar power to recharge the internal battery. This type of tracker may not be a viable solution for an animal that only comes out at night. 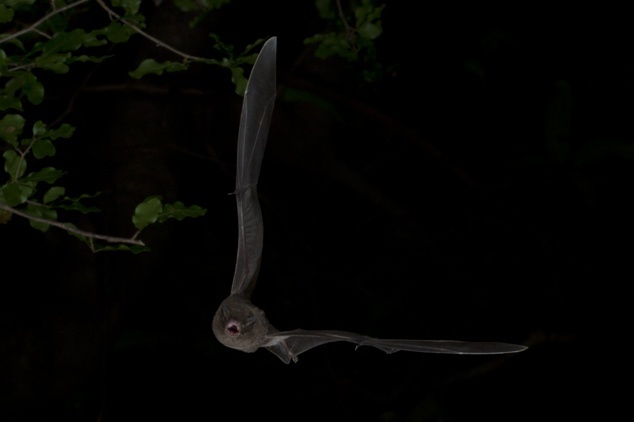 Other techniques, such as geolocation, require bats to be recaptured in order to download the transmitter data or, in the case of radio transmitters, necessitate long-distance tracking on foot or by vehicle. This is difficult when the animal you are trying to capture and track is smart and learns to avoid traps, lives in a group with large numbers and is fast flying. The current shortfall of traditional satellite tracking equipment for small animals therefore necessitate a tracking method that does not use a heavy transmitter, does not require an external power source and does not need to be retrieved to download data. Our study bats will be marked using a MiniHPT8 Passive Integrated Transponder (PIT) tag manufactured by Biomark. These tags are the same size as a grain of rice and are encapsulated in biocompatible glass that comply with all international standards and regulations. Each tag is like a digital fingerprint that provides 100% unique identification for tagged individuals. These small tags may last the entire lifetime of the animal, as they do not require a battery. These tags have a variety of advantages. They are lightweight, and because they are injected under the skin of the study animal, they do not affect the behaviour of other animals towards the tagged individual (as is often the case with satellite tags or other external markings). They do not hinder the animal’s movement and do not make them conspicuous to predators. Although they cannot track an animal’s location the way a satellite tracker does, these tags allow scientists to determine presence and absence of tagged individuals in an area. This is done by deploying some specialist equipment, known as an antenna chord reader, in places such as cave entrances and artificial water points. When a tagged bat flies past the reader, it logs that the bat was present and records the unique tag ID code, much like a scanner that you would find at your local grocery store. These readers are completely portable and can travel wherever we go. In this way, we can determine whether the tagged bats move from certain caves to other and what time of year they are present or absent. An added advantage is that we do not need to recapture the bats to obtain data. AfricanBats NPC is a registered Not for Profit Company (2012/007836/08), and is governed by the conditions as set out in the South African National Companies Act (71 of 2008), together with the document of incorporation, subject to section 10 of the South African National Companies Act (71 of 2008) relating to Not for Profit Companies. We are also registered as a Public Benefit Organization (930 049 527), governed by section 30(3) of the South African Income Tax Act No 58 of 1962 (amended 1 March 2012) and Nonprofit Organization (155-917) set out in the South African Nonprofit Organization Act 70 of 1997. 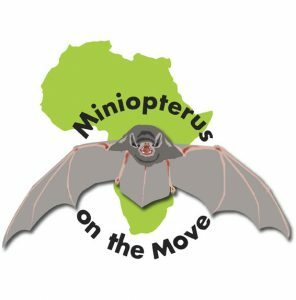 Your donation will go a long way to assisting AfricanBats NPC meet its aims of Conserving bat populations in Africa - funds will be directed to critical programs and projects that are in need of support. SECTION 18(A) TAX CERTIFICATE available on request to South African taxpayers for Credit/Debit Card, EFT and PayPal donations –please send confirmation of donation and request for tax certificate to 18A@africanbats.org. Acceptance of any contribution, gift or grant is at the discretion of the AfricanBats NPC. AfricanBats NPC will not accept any gift unless it can be used or expended consistently with the purpose and mission of AfricanBats NPC. AfricanBats NPC will refrain from providing advice about the tax or other treatment of gifts and will encourage donors to seek guidance from their own professional advisers to assist them in the process of making their donation. AfricanBats NPC will accept donations of cash or publicly traded securities. Gifts of in-kind services will be accepted at the discretion of AfricanBats NPC. Certain other gifts, real property, personal property, in-kind gifts, non-liquid securities, and contributions whose sources are not transparent or whose use is restricted in some manner, must be reviewed prior to acceptance due to the special obligations raised or liabilities they may pose for AfricanBats NPC. AfricanBats NPC will provide acknowledgments to donors meeting tax requirements for property received by the charity as a gift. However, except for gifts of cash and publicly traded securities, no value shall be ascribed to any receipt or other form of substantiation of a gift received by AfricanBats NPC. AfricanBats NPC will respect the intent of the donor relating to gifts for restricted purposes and those relating to the desire to remain anonymous. With respect to anonymous gifts, the AfricanBats NPC will restrict information about the donor to only those staff members with a need to know. AfricanBats NPC will not compensate, whether through commissions, finders' fees, or other means, any third party for directing a gift or a donor to the AfricanBats NPC.